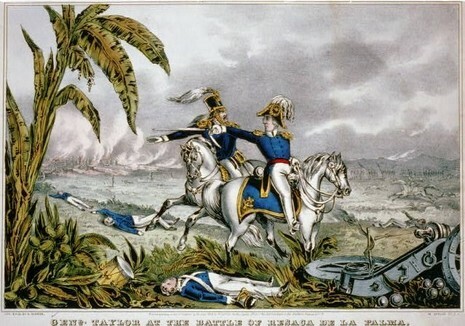 At the Battle of Resaca de la Palma, one of the early engagements of the Mexican-American War, United States General Zachary Taylor engaged the retreating forces of the Mexican Ejército del Norte ("Army of the North") under General Mariano Arista on May 9, 1846. On May 8, Zachary Taylor arrived with 2,400 troops to relieve the fort. However, Arista rushed north and intercepted him with a force of 3,400 at Palo Alto. The Americans employed "flying artillery," the American term for horse artillery, a type of mobile light artillery that was mounted on horse carriages with the entire crew riding horses into battle. It had a devastating effect on the Mexican army. The Mexicans replied with cavalry skirmishes and their own artillery. The U.S. flying artillery somewhat demoralized the Mexican side, and seeking terrain more to their advantage, the Mexicans retreated to the far side of a dry riverbed (resaca) during the night. It provided a natural fortification, but during the retreat, Mexican troops were scattered, making communication difficult. During the Battle of Resaca de la Palma the next day, the two sides engaged in vicious hand to hand combat. The U.S. cavalry managed to capture the Mexican artillery, causing the Mexican side to retreat — a retreat that turned into a rout. Fighting on unknown terrain, his troops fleeing in retreat, Arista found it impossible to rally his forces. Mexican casualties were heavy, and the Mexicans were forced to abandon their artillery and baggage. Fort Brown inflicted further casualties as the withdrawing troops passed by the fort. Many Mexican soldiers drowned trying to swim across the Rio Grande.